The medical administration which commenced on Monday 10th April l moved to Cline town community where they also carried out a mobile clinic for two days and the remaining days were spent at the Under Five Women Clinic, Congo Cross where they ended their one week mission on the theme “Direct Health Care Delivery to Communities and people in need”. 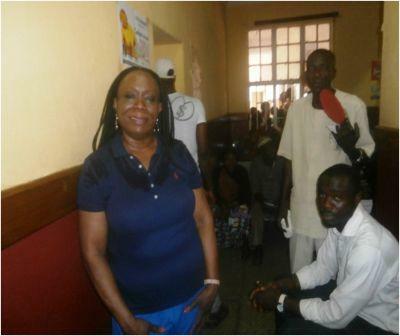 The Leader of the week long medical mission from USA and UK), Madam Isatu Wurie, said they are in the country with doctors, nurses and medical professionals to treat various illnesses to all class of people with the motive of given back to their country. 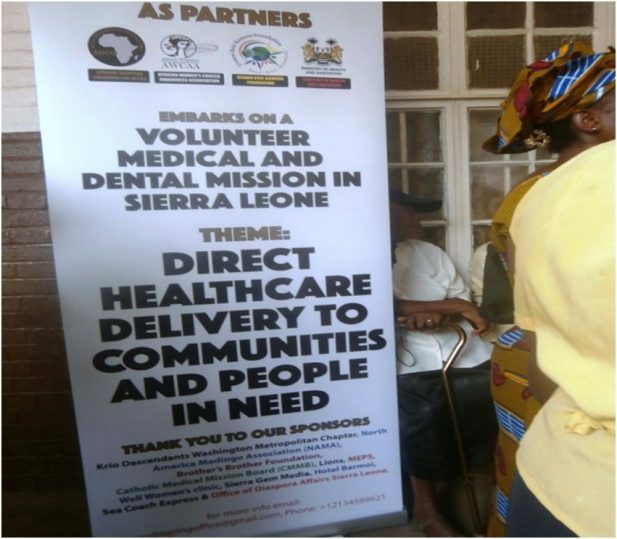 ‘“The one week medical administration will make different among our people”’ said Madam Wurie and expressed appreciation over the warm welcome accorded them stressing that this will motivate them to do more and to come back next year. 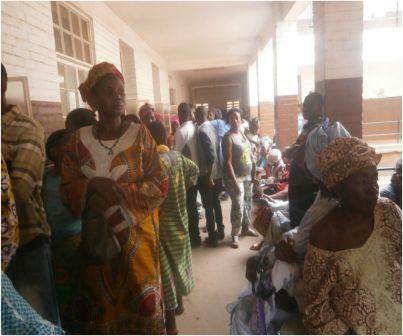 She disclosed that, the medical professionals will examine and treat all sort of diseases but they are not performing any operation because there is no surgical general practitioner among the experienced medical administrators. According to her, dentists and other medical administrators will treat sick people on free of cost basis. She invoked God’s intervention to have more boost in the Diaspora so that they will keep on coming to the country in subsequent years in an effort to assist government in improving health care delivery system in the countrywide. 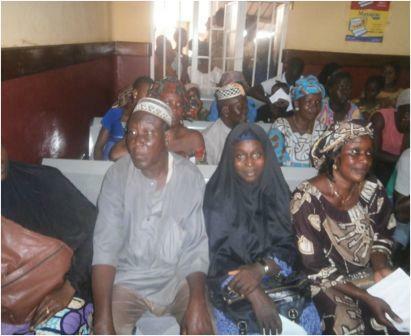 She expressed gratitude to the Usman Boie Kamara Foundation (UBKF) for not only hosting the visiting team but to work in collaboration with some local organization especially members of the Concern Traders Union for disseminating the message among beneficiaries which she said resulted to the large turnout of both women, young and old people who were scrambling in the queue. “We give credit to the Usman Boie Kamara Foundation and all those whom put hands on deck to ensure the success of the mission. The Leader of the mission, Madam Wurie expressed thankfulness to members of the UBKF for playing what she described as their best role and articulated hope to attract more partners. She concluded by promising to extend the program to the provinces by next year and she encourage all Sierra Leoneans to make use of the opportunity as it appears occasionally. Speaking on behalf of Concern Traders Union Sierra Leone which is one of the strongest organizations behind information dissemination about the coming of the medical professionals in Sierra Leone from the Diaspora through public meetings, Vice President Elizabeth Sesay articulated thankfulness to the visiting medical team for leaving their entire schedule to actualize such an important initiative. She assured the firm commitment of her organization and followers to continue calling on the people to see the need to be part of the free of charge health care delivery exercise. She thanked Government through the Ministry of Health and Sanitation for creating the required avenue and atmosphere.